Over 50 years ago I built some furniture for my cabin, back in the hills of Kentucky, on a stream called the Kinniconick. I used full, red cedar logs from Tennessee, notched and crossed for legs and had other logs milled for a table top. Wish I were your age again and back in my cabin in the woods. I would dearly love a cabin in the woods! i've got a small old watermill that needs doing up, anyone interested in a weekender is welcome to it... The only but is that it's in Europe. I really am impressed at your logical build of things , the trestle table etc. This solid furniture is become more & more desirable these times and I can see how it sells well. I have a set-up location and all I need is to get at it. Thanks for all you have done . Really like your work and your philosophy on living! I've been lucky enough to earn a very good income by most anyone's yardstick but the key to enjoying life was to always try to live the uncomplicated? lifestyle you describe and eventually reaching a position where I could step away from the rat race and enjoy it all. I'm looking forward buying a set of plans and building one of your tables in the months ahead with some cherry from a farm that has been in my family for over 150 years! Thank you for the message, I'd love to see how your table turns out. Email me some pics once you get it done. I'm lost with the down load. I paid the $10 for the bench plans, but how or where do I find it on my computer? I just watched the video of the trestle table and I found it very helpful and full of ideas. I do have one suggestion that may prove helpful. Once you cut the slots in the through tenons for the wedges simply drill a hole just before the shoulder so there will be little chance of the wedge causing a split further down. I would be interested in purchasing your plans on this build, will you be making one on this project? I may. The exact design and scale of parts may be a problem for some so I am considering doing a design based off that table that can be made from materials that are less difficult to source. Also the angles used in the long braces would change for different length tables. So I think for Woodworking Plans, it needs to be simplified a touch. I will make a video or post on the topic if I do make them. Thank you for asking. I’m interested in the white oak trestle table plans too. Thx! I recently built a farmhouse table. My last finish coat was a wipe-on gloss, and the result is a finish that is too glossy. Do you have any recommendations for dulling the finish to a more hand-rubbed look? This video, around the 5 minute mark explains how I finish my tables. https://www.youtube.com/watch?v=o9SMorrVk5E I use satin finishes as I don't like gloss outside of a few circumstances. Using gloss on rougher surfaces like farm tables just reflects light in a bad way. I suggest dulling the finish down with something like this. 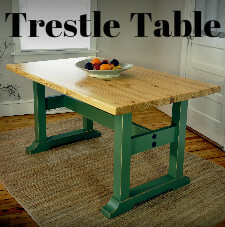 http://amzn.to/2ns1ELU If you have seen my recent Oak Trestle Table video, that is what I used to get an even satin finish. It will work better than sandpaper or steel wool. You could also just scuff the finish and put satin over it...but your building up more layers of finish which you may not want to do. Long term, I'd go satin on your finishes, looks best most of the time and does not glare as bad. Good luck. Danny, Just now saw your question. Prices vary, even for the same item. How I price is more important. Price for the item not your time, If you price for how much time it takes you, are you going to charge less once you are faster at making it? I wouldn't. You are selling a product, not your services as a woodworker. Decide what price you can put on a given item in the location you are selling. Go online and look up websites of big companies that sell similar products. In my case, I could look at West Elm for example. That will show a price that they have found to work well. Keep in mind, they are a large company and you are one man, so you may have to charge more...or due to your location, less at first and move up. What's most important is getting your product in front of people. I also suggest focusing on one or two items, here's a link to my book. It would be helpful in deciding what to make and how to develop it. http://www.thehomesteadcraftsman.com/p/book-1.html or you can just click on the "Books" tab at the top of my website. Let me know if you have any other questions. Enjoy all your vids,$12,000 house,I had to do $27k to get n.east Texas,thanks,rob. I enjoyed the Trestle table build and how (unlike most) you lifted your middle supports closer to the top. Do you sell those plans? I am a furniture builder and would enjoy those plans. I am commissioned to build a large white oak table & I believe my customer would fall in love with that table. Let me know !